Integration of natural and artificial lighting through the use of IoT protocols. We have adopted the Scrovegni Chapel. 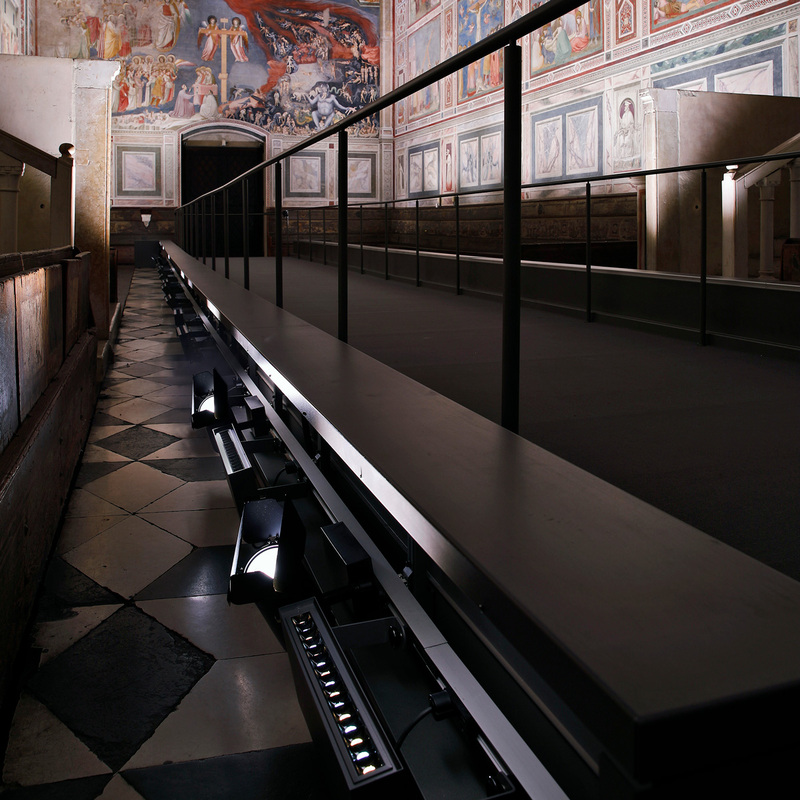 Based on an agreement with the Interdisciplinary Scientific Commission for the Conservation and Management of the Scrovegni Chapel, iGuzzini were tasked with enhancing the chapel’s extraordinary beauty. To achieve this, we created a new lighting system incorporating latest-generation luminaires that highlight the chromatic richness and intricate details of the Giottesque masterpiece. 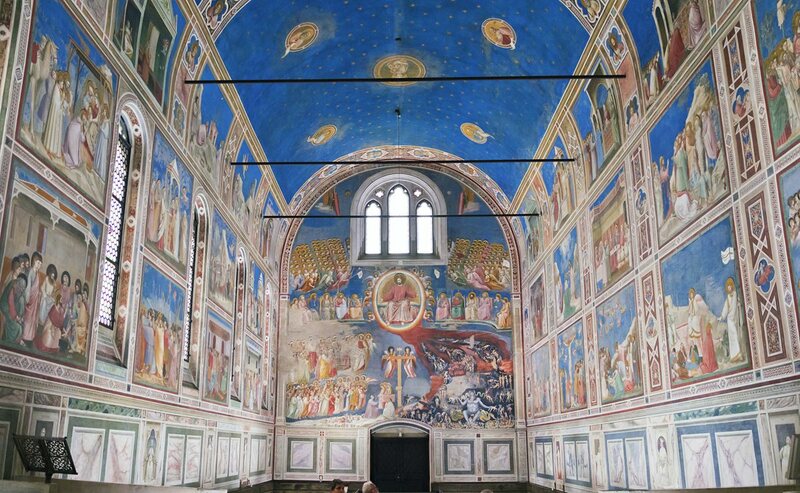 The Scrovegni Chapel in Padua is an absolute masterpiece of medieval art. 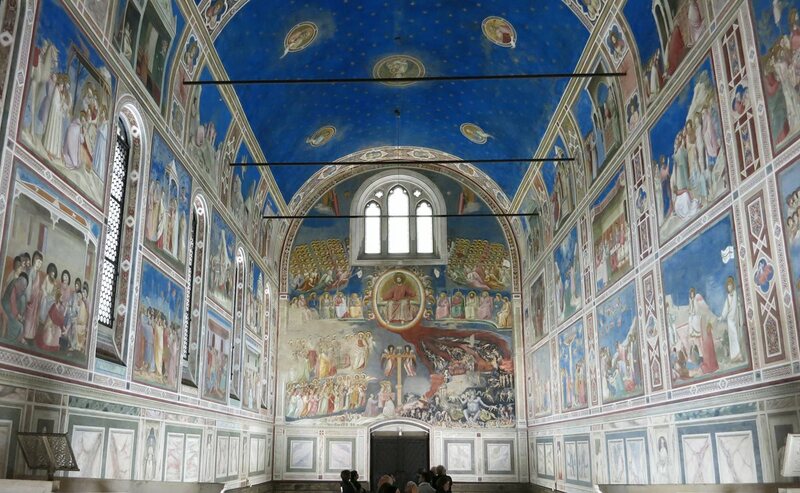 Currently being considered as a UNESCO World Heritage site, the chapel hosts Giotto’s most complete series of frescoes. Painted at the peak of his artistic career, these frescoes are, without a doubt, his greatest works. The Chapel is dominated by a starry vault, divided into two perfectly equal areas which both have Virgin Mary and Christ giving His blessing, in their centre. The dominant position of the Virgin immediately indicates Her leading role in the chapel’s frescoes cycle, as She is the intermediary between Her Son and mankind, and therefore, the path to Salvation. Virgin Mary’s central role is declared the moment visitors enter the chapel, as their attention is immediately drawn to the depiction of the Annunciation on the triumphal arch. This is because the space dedicated to the “Mission” (the moment when God entrusts Archangel Gabriel the task of announcing the news to Mary) painted on the lunette of the arch, is unusually large. Meanwhile, the depiction of the Last Judgement on the opposite wall portrays the beginning and the end of the main event in the life of every good Christian: salvation. On 5 July, 2016 we signed an agreement with the Municipality of Padua to update the existing lighting system at the Scrovegni Chapel in Padua. The system installed in 2002 consisted of bespoke fluorescent and metal halide luminaires, in line with the most advanced technology available at the time. The new lighting system was officially unveiled on 11 September 2017 in the presence of Minister Dario Franceschini. The new lighting system combines Tunable White LED and IoT technologies, developing a solution that integrates artificial light with natural light. The project faced a number of design constraints, including the ground-based positioning of the lighting system and the decision to conserve the metal profile used to cover the luminaires from the existing system, even if the new fittings are significantly more compact and could have saved a fair amount of space. What has notably improved, however, is the visual impact of the luminaires thanks to their very low luminance (fig.1). Using Tunable White LEDs, controlled by a system that carefully regulates the continuous spectra of individual LEDs, allows defining an optimal emission spectrum on-site, by either measuring the variation in colour purity or by directly comparing the visual experience of the artwork (fig. 2). Artificial light extends the chromatic perception of the reds characteristic to the previous system from an upper limit of 690 nm to over 740 nm; thereby, improving the degree of sensitivity perceivable by the naked eye in this colour range. The luminaires used in the 2002 system maintained a UV component of 59 μW/cm² at one metre from the surface of the luminaires, which dropped to approximately 0.7 μW/cm² at the top of the wall, a value just under the permitted limit. By zeroing UV emissions, the new system ensures optimal conservation conditions for the pigments in the frescoes and the products used to restore them. The Scrovegni Chapel is open to the public 10 hours a day for 363 days a year, so the frescoes are illuminated for approximately 3500 hours. The average illuminance value on both walls is 87 lux, equivalent to a value of 304,500 lux/hours annually produced by artificial light alone. This constitutes approximately 50% of the limit considered admissible by the standards. a) differentiated illumination levels for the windowed walls compared to those illuminated directly, in order to compensate for and reduce the veiling luminance produced by the windows while also reducing the risk of over-lighting on account of the natural light entering the space. b) matching the colour temperature of artificial sources to that of natural light. The sensing unit developed for the Scrovegni Chapel is incorporated into each node of the IoT Wireless Sensor Network (WSN) which is based on an IPv6 (Internet Protocol version 6) structure of sensor nodes designed to measure the illuminance and colour temperature. The core of the custom-made solution is a WSNode, which is a concentrated technological hub that allows any object to connect to the internet by associating it with a globally unique IP address. Each sensor node is the constitutive unit of a mesh network that self-configures and auto-installs without the intervention of specialised staff and can host a range of sensing and function-activation units. 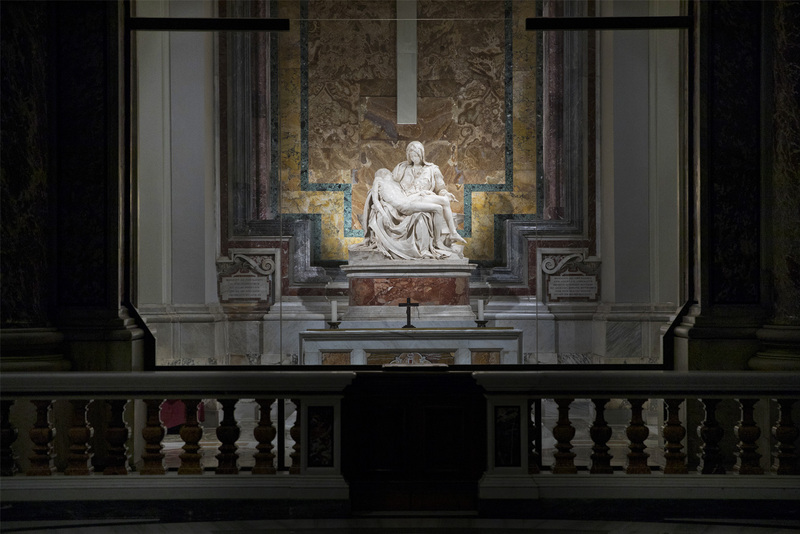 In the Chapel, the sensors detect both the intensity and the spectral characteristics of the light; based on the data acquired, the lighting system automatically varies the quantity and quality of artificial light to be integrated with the natural light in order to achieve the pre-defined values. The contribution of artificial light is therefore adjusted in real time according to sensor measurements and to related information sent by the control system control unit. The lighting system is connected to the Wireless Sensor Network Border Router (collector node) and transmits data to the control unit, which is programmed to adjust the luminous intensity and the correlated colour temperature of each individual luminaire (fig.3).